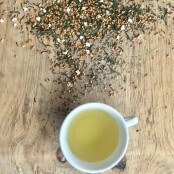 Genmaicha is a light green tea - Rice is added to Bancha tea and under the heat of firing it pops - giving a delicious, savoury, buttery popcorn flavour! Pop-ular in Japan. Our Genmaicha tea is a blend of Organic Bancha and Organic roasted Rice. The rice gives the tea its distinct flavour. Today there are 2 styles of Genmaicha, one of them allows some of the rice to pop during roasting, while the one we have makes sure that the rice doesn’t pop at all. Genmaicha, the Japanese name for green tea mixed with brown rice. The legend of Genmaicha and how it has become a popular choice of green tea today stems from a Tea shop owner in Japan - in order not to waste traditional Japanese Rice Cakes (called Kagami Mochi) which is made for an annual ceremony, the Tea shop owner roasted them and decided to put it into the loose leaf tea! This also has a good nutritive effect and was sometimes the only nutrition that the poorest people in the country could have as at times they couldn’t afford a meal. So traditionally this was a peasant drink, it was not celebrated by the masses, but now we all enjoy a cup or two. Nicknamed Popcorn tea because when roasted the small grains of rice pop into what look and taste like mini popcorns, a delicious buttery popcorn flavour! 50% Organic loose leaf bancha green tea, 50% Organic toasted rice. Works best with 2-3g of tea, in 200ml of freshly drawn water, boiled and cooled to 80°C and allowed to brew for 2-3 minutes,. We believe in sourcing the best quality, best tasting leaf we can from all over the world. Paid for first clsss delivery, two weeks later still haven’t received my tea with no explanation from Suki Tea. Do not reccomend. Service rating : Excellent. Tea arrived well packaged Website was easy to order from. Service rating : Fast efficient service and responsible packaging. Product : Delicious and refreshing.